In searching for a publication or writings of some description pertaining to the metropolis on the evening before All Saints Day, although no doubt there are many in existence, only one was readily apparent for the time being. Written by Charles Williams All Hallows’ Eve (1945) was apt for the subject of today’s post at least in terms of title and setting if nothing else. Charles Williams was born Islington 1886 living in Holloway until 1894 when his parents moved to St. Albans from where they ran a shop selling art materials. Later returning to London to study at University College. In 1908 he began work as a proof reader for Oxford University Press at the London offices in Paternoster Row moving to Warwick Square 1924 where the name Amen Corner given to the warehouse on the site of the old Newgate Prison still remains. Rising to editor Williams worked in London until 1939 when the outbreak of the Second World War saw the publishing house relocate the London arm of the business to Oxford. 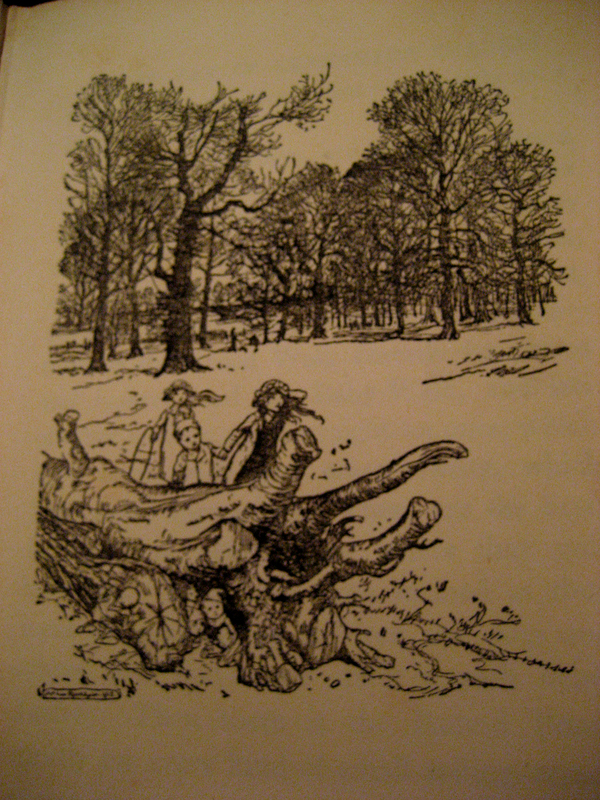 The move to Oxford was instrumental in Williams becoming a member of the Inklings literary society formed by C. S. Lewis which included J. R. R. Tolkien in the group. All Hallows Eve takes in some parts of the City beginning on Westminster Bridge continuing the narrative encompassing St. Paul’s, Holborn, Tooting and Highgate Hill. Central to the story is a hall described as being ‘Behind Holborn, close to Great James Street, in a short street undamaged by the raids’. 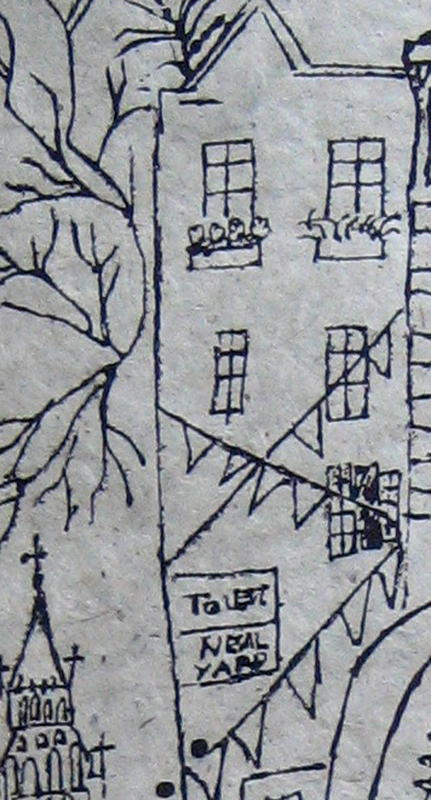 The reality of this imagined street could be any of a half dozen in that neighbourhood, however for the purposes of this post it is well suited to the convenience of boz to suppose that it may well have been Dombey Street. The reason for this is nothing to do with the street’s 1936 renaming after a novel by Charles Dickens. This thoroughfare was formerly known as East Street and as we have been disappointed with fictional tales we may conjure some factual horrors for All Souls Eve in the form of the building practises of Nicholas Barbon who obtained the reversion of a fifty one year lease for the development of East Street in 1684. Of the original houses put up by Barbon only numbers nine to fifteen have survived as a result of restoration much as took place in Red Lion Square for any who recall last weeks post. This related from PRO Chancery Cases within an excellent account of both Nicholas Barbon and speculative building in the eighteenth century The Birth of Modern London (1999) Elizabeth McKellar. Being not currently in possession of any pictures of Dombey Street we will make do with a photograph of a street which at the time of capturing boz did not take care to note so beyond recalling that it is very near the locality of Red Lion Square it will remain uncatalogued until a return to that district is made. Should it be identified by any observers in the meantime that would be most useful in facilitating the correction of such negligible reporting. 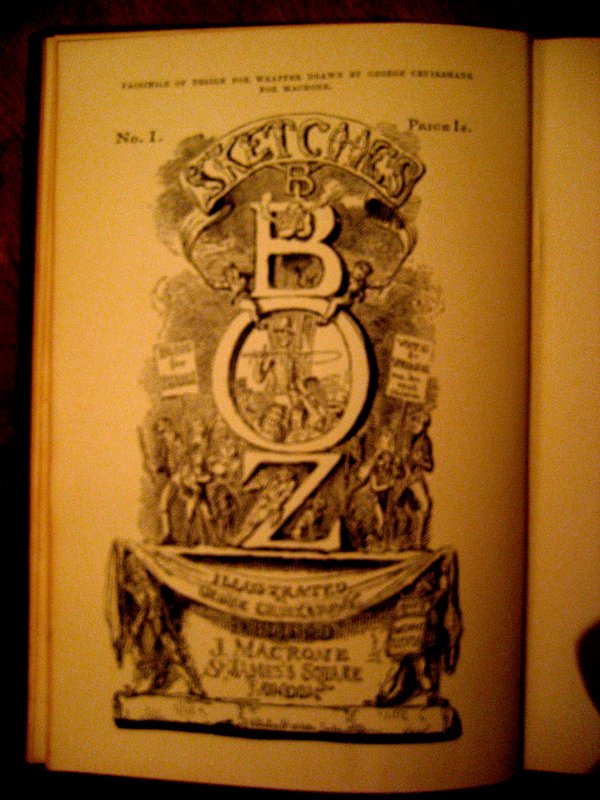 This 1836 account by Charles Dickens taken from Chapter twenty two of Sketches by Boz alludes to a scene which could be considered if not cheerful then one could certainly forgive the reader for believing the establishment described to be warm and well ordered in fact rather more welcoming than most workhouses at that time if this observation is accurate. For now the benefit of the doubt must be granted so we will return to Newgate at a later date when there has been time enough for a little research away from the rose tinted glow of Dickens spectacles. 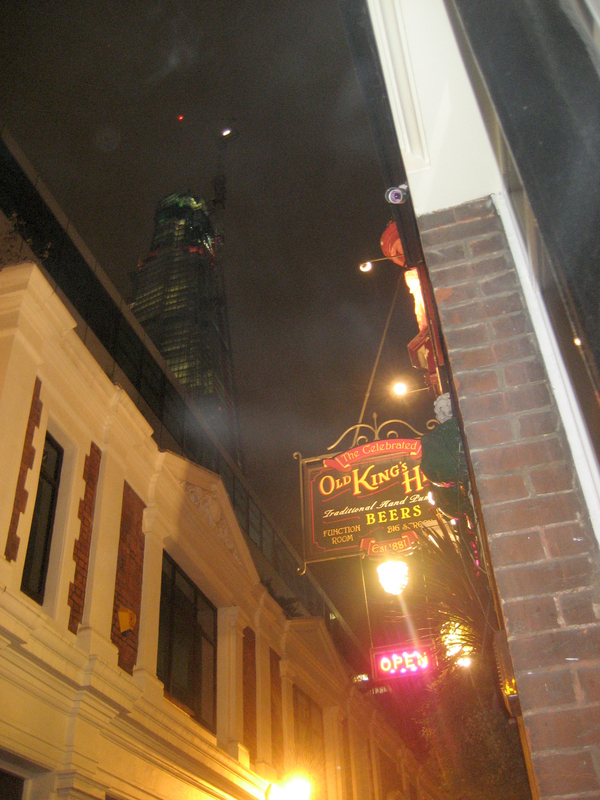 For quite some time now the spectre of the Shard has afforded some fascination in these quarters. So on an evening of apparitions will bid farewell with a night time view; taken from the gutter whilst looking at the stars; the wisps are likely to be from the smokers in the alleyway but can be viewed as something more whimsical should it so please. It has taken a little time for this post to be compiled as a result of an eclectic collection of snapshots taken on a warm Spring evening 26 April this year. The only connection between the photographs is that boz paused long enough to look and wonder on the way from Clerkenwell to a destination in Covent Garden. Building commenced 1926 and completed 1929 for the congregation of the South Place Ethical Society, a group of non conformists formed 1795 known as the Philadelphians or Universalists. Originally based in a building at 11 South Place, Finsbury where William Hazlitt was a regular attendee and from which they retained the name on moving to the larger premises at Red Lion Square. Apparently Red Lion Square was numbered differently with the site of Conway Hall being number 37 not 25 as it is today. Have been unable thus far to find any evidence of renumbering and no Census from 1881 to 1911 lists a number 37. 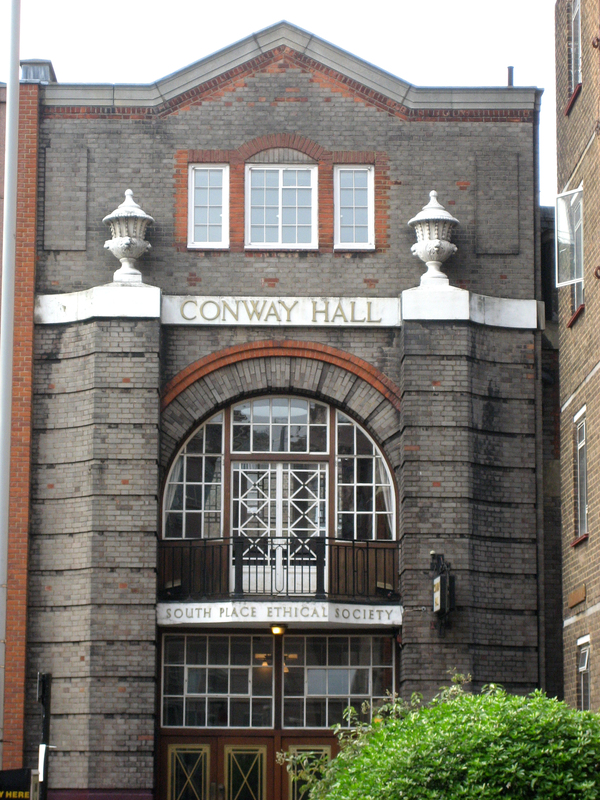 The site of Conway Hall was supposedly purchased as a tenement block but again no such building is in evidence by 1911. “A few inhabited homes. Many are business premises. At the corner of Leigh Street are flats. Pink as map. There is a common lodging house on the NE side of this square which is not registered because it takes a stipulated sum per week and does not put more than a given number in a room. This seems to be the difference between lodgings and a common lodging house.” Booth Notebooks B354 p21 As observed by George Duckworth walking with Police Constable Turner Tuesday July 12th 1898. It is doubtful that the flats noted are the tenements that later became Conway House being that Leigh Street was on the opposite side of the Square. 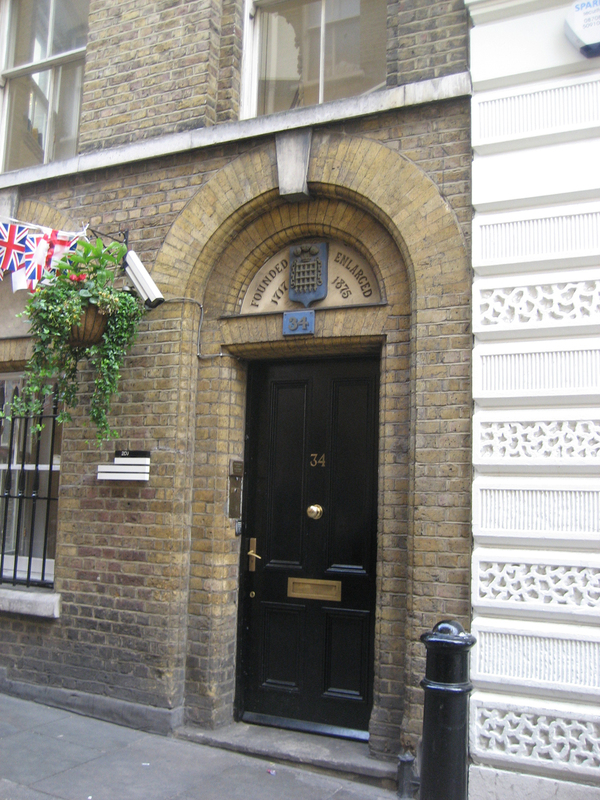 It is likely that the lodging house that perplexes George Duckworth was the Girls Friendly Society lodgings at number eleven present until the 1911 Census with boarders being young women only. Any information as to the renumbering of Red Lion Square would be very well received. 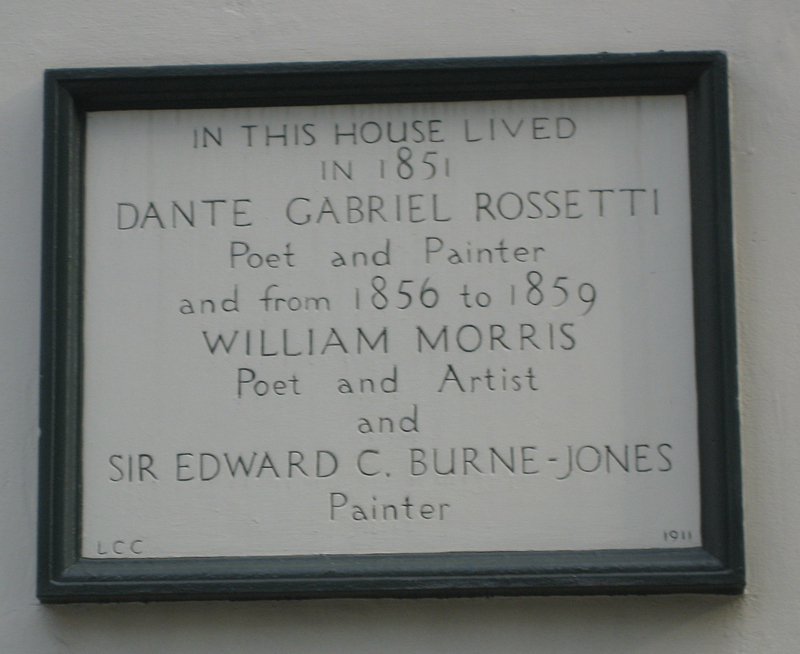 It is here that Danté Gabriel Rossetti is reputed to have briefly lodged in 1851 and later recommending the same rooms to William Morris and Edward Burne Jones in 1856 which were apparently damp and decrepit. Given that these were within the original building the condition is to be expected of Nicholas Barbon’s standard of construction indeed it is to be wondered upon that the house was still standing at all in 1856. 1861 saw the firm Morris, Faulkner & Co. established at number 8 Red Lion Square. 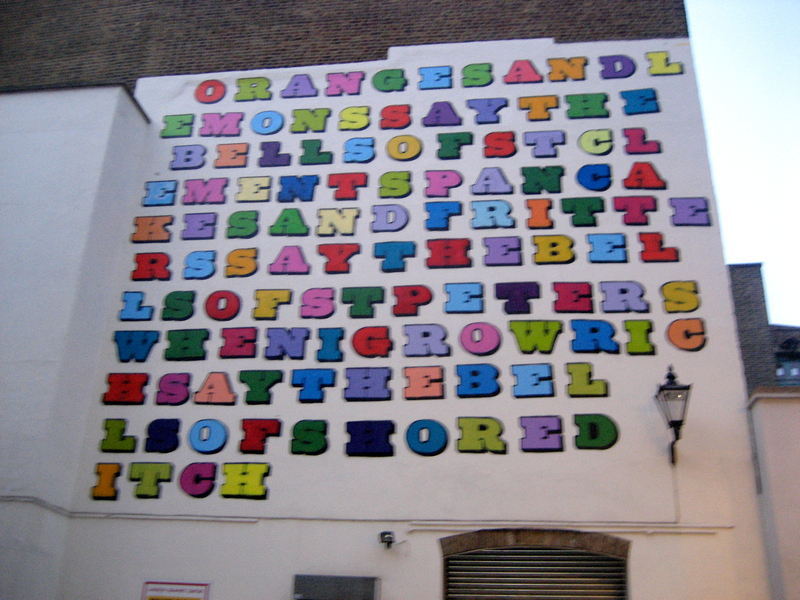 There is of course much more of interest in Red Lion Square and numerous notable residents, but that is not for this post lest we forget that we are on a walk and dusk is approaching so must continue our journey en route to Seven Dials. 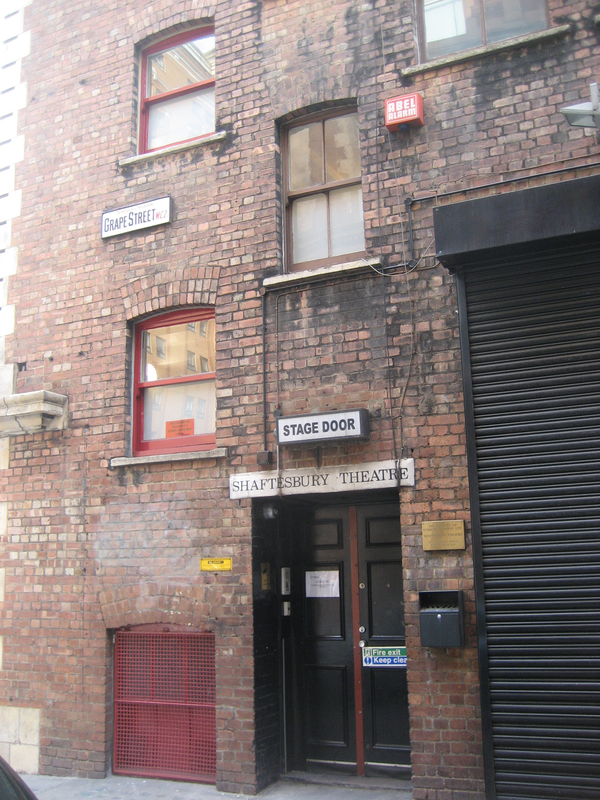 Down Red Lion Street and along High Holborn takes us by Grape Street where it is deemed necessary to capture the stage door of the Shaftesbury Theatre. Although disappointingly lacking in thespian activity at such an early hour in the evening it does retain a couple of original sash windows (to the right of the picture) sash windows being of particular attraction for boz. Opened 1911 as the New Prince’s Theatre and becoming the Prince’s Theatre 1914 it was acquired by EMI 1962 to be renamed the Shaftesbury Theatre 1963. The Booth notebooks make little mention of this site as the area was being rebuilt as our guide George Duckworth notes on his travels of 1898 with Grape Street as yet not in existence. 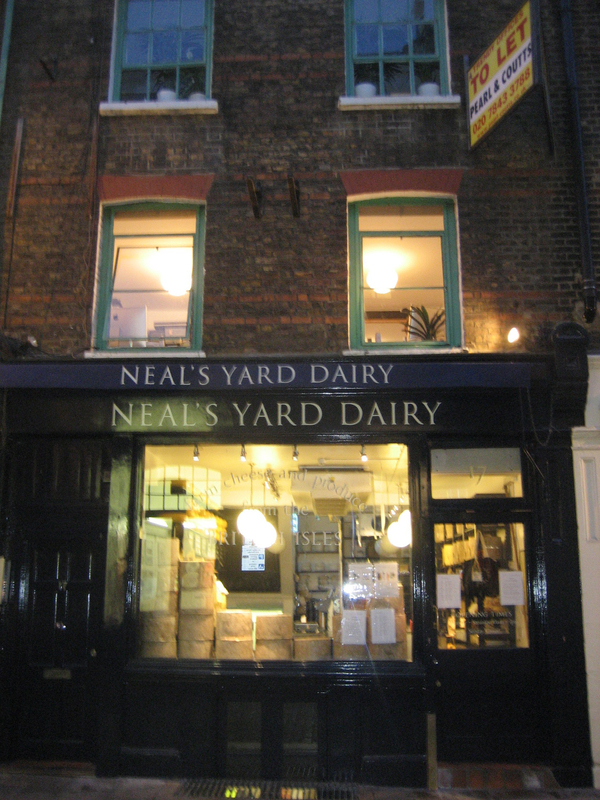 Across Shaftesbury Avenue into Neals Yard. Colourful now but according to George Duckworth report for the Booth Notebooks all stables in 1898 the Poverty map showing Black edged with Purple. Continuing onto Long Acre via brief visit to Stanfords’ excellent emporium of maps and printed goods back into Rose Street by the establishment of the Lamb and Flag public house. Being suit time on a clement Tuesday evening there is a throng at the bar spilling into the street. Reputedly the oldest pub in Covent Garden although records are sketchy, the earliest date at which the house is recorded as licensed premises in the Greater London rate books is 1772 as the Cooper’s Arms. According to Strypes Survey 1720 Rose Street was originally named in two parts as White Rose Street being the northern arm and Red Rose Street the southern part over time the distinction is lost. Another example of confusion with numbers the building which is the Lamb and Flag at number 33 was originally 11 Rose Street and listed as such in the 1881 Census with one Caleb Cullen and his wife Hannah in residence as wine and spirit merchants. 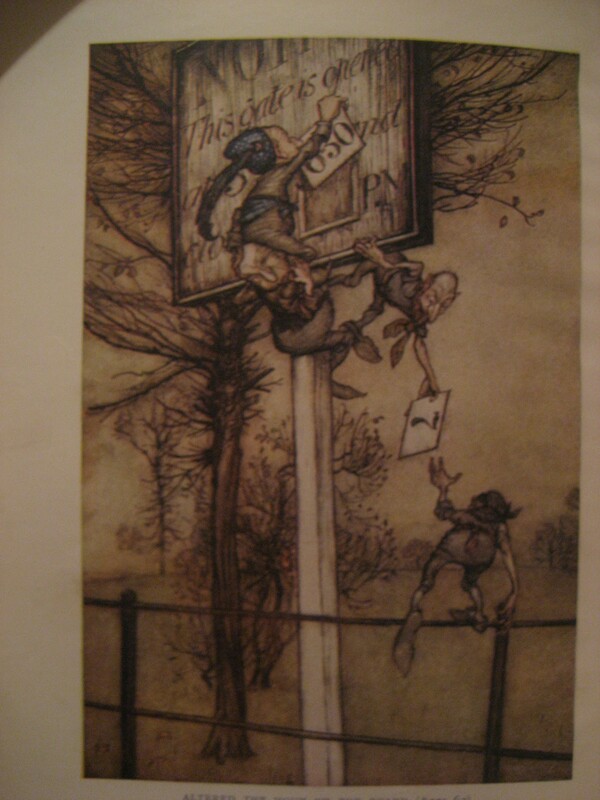 At the time of taking the photograph it was not realised that the building would be later encountered in researching the career of Arthur Rackham; stalwart readers will recall this from the last post as being the one time workplace of the illustrator. Now part of Garrick House which incorporate numbers 27-32 King Street and housing solicitors offices. It should be noted that the rather unnecessary and quite dreadful plastic bunting to the left of the picture was a temporary nod to patriotism given impending nuptials and fortunately not a permanent fixture. Thus noted George Duckworth citing Police Constable Tait’s observation 26 July 1898. Being much too interested in the business of others boz wonders if the flat above number 17 is now let; who has taken it; what sort of a person they are. 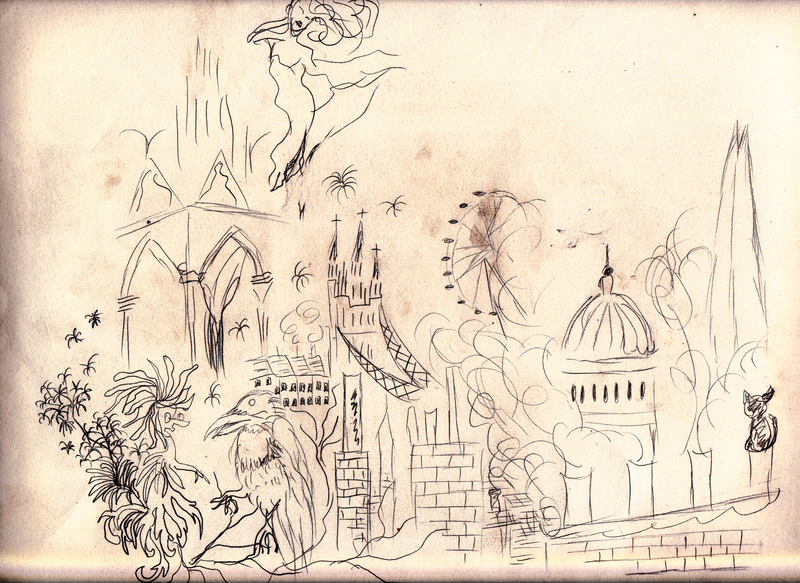 In pondering this the journey ends at the Crown in Monmouth Street so must take leave with a sketch for now. It is has been some time since there has been a new post added from boz with the months of May and June being sadly lacking in discourse. 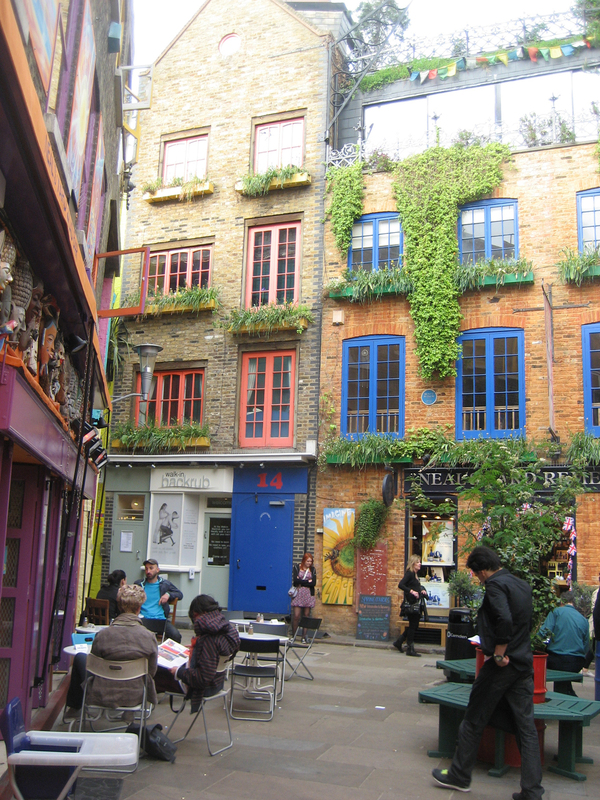 Much of this time has been taken up in the district of Clerkenwell and in particular the Craft Central building Pennybank Chambers 33-33 St. John’s Square. One of the fruits of a series of exhibitions has been a new screen illustrating the environs of Clerkenwell that LondonKillsMe are currently hawking. 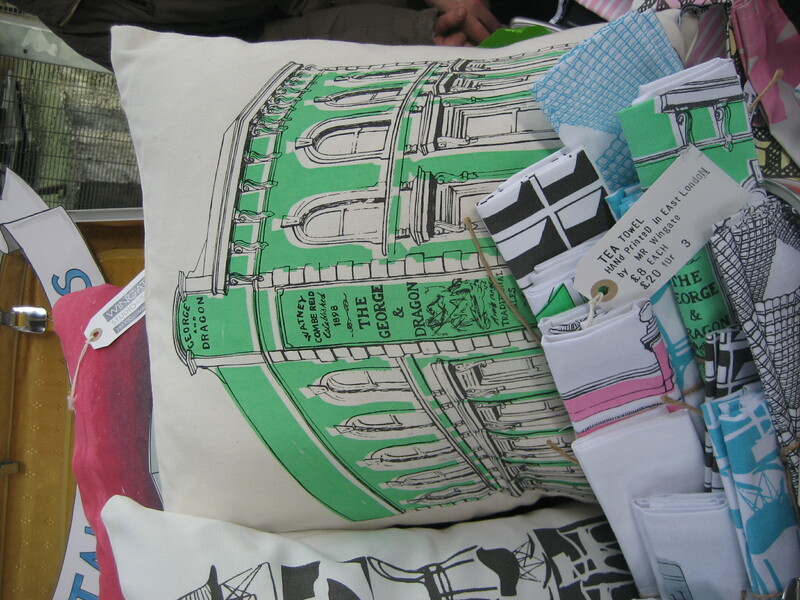 During many visits to Clerkenwell sketchesbyboz has begun tentative probings into the history of the district. Beginning with St. John’s Gate as a result of a commission more of which at a later date, and inspired by small observations en route. As yet such musings as have been gathered are unsorted and form no coherent narrative, hence for the time being an anthology of miscellaneous snippets. Informed followers of this blog are thoroughly encouraged to contradict where necessary any errors that may be chanced upon. Beginning with St. John’s Gate it was with great interest to discover it to be the childhood home of William Hogarth from 1701 to 1709 whose father had opened an unsuccessful coffee house in the building in 1703. 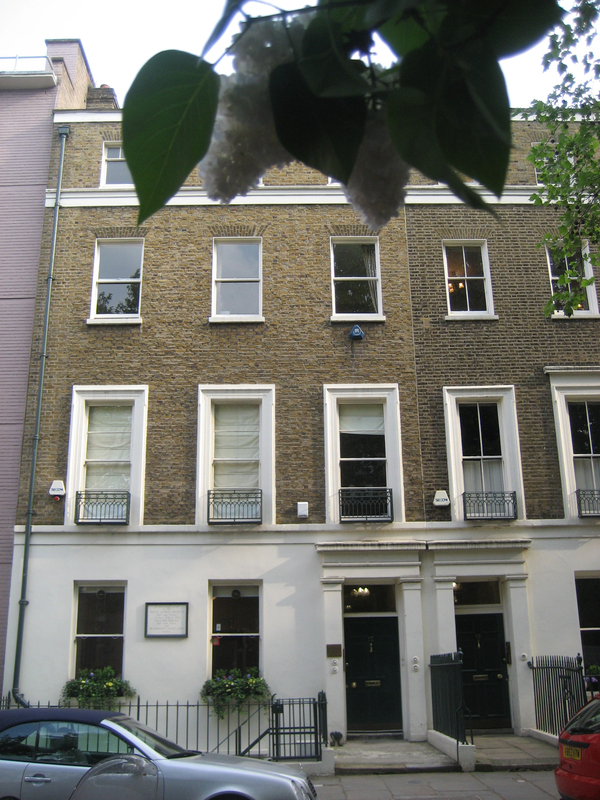 Also the home of Edward Cave St. John’s Gate became the first offices and printing house of The Gentleman’s Magazine founded 1731 and thus sometimes workplace of Samuel Johnson from 1737. Old images found randomly on the internet employing the usual disorganised fashion of research favoured tell of business and trade activity in the building. This earlier picture c.1860 shows the Jerusalem Tavern to the left of the picture. To the right S. Wickens Coffee and Dining Room which you can just make out etched onto the glass of the window above. 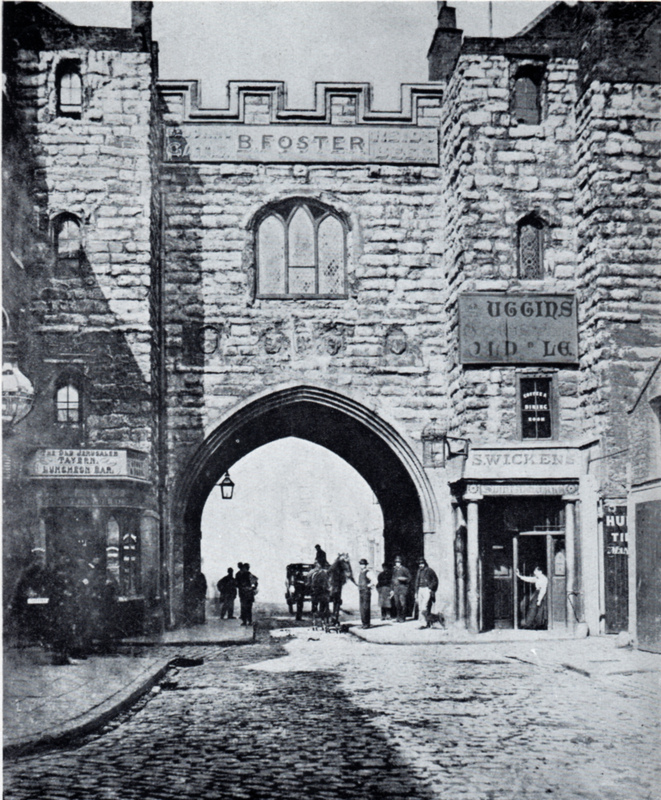 Did Uggins sell Old Ale or where they in fact Huggins Timber – see the door on the right – Photoshop has yet to reveal what B. Foster were purveyors of and attempts at cross reference in Kelly’s Directory and the like have been little help thus far. 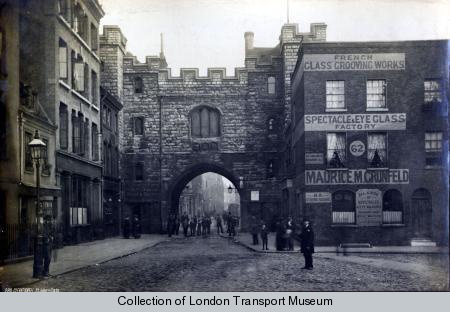 In the slightly later picture c.1873 from London Transport Museum archive these have been replaced by the French Glass Grooming Works and Spectacle Eye Glass Factory of Maurice M. Grunfield. 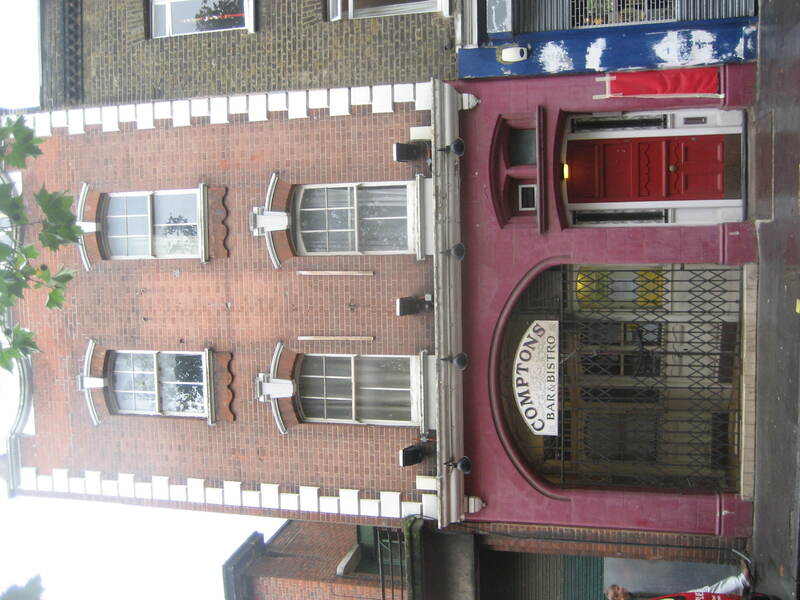 Another Tavern of interest which appears to have met a sad demise is just around the corner off St. John Street in Compton Street is Comptons Bar. We know nothing about this establishment other than pausing to take a photograph of the very nice building which contains it. It is hoped to uncover more before it is purchased by developers and turned into something dreadful in the name of luxury apartments. It would be a great to delight to hear from anyone who ever went there in the times it was a thriving concern. 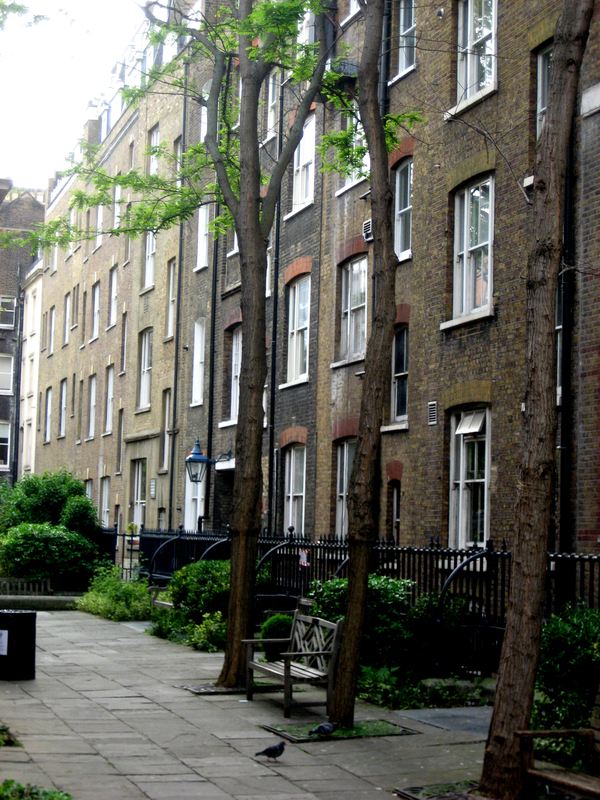 George Gissing’s publication of The Nether World (1889) also focused on Clerkenwell as an abject slum whilst presenting the new model dwellings to the area in a very unsatisfactory light. It is understood that Pennybank Chambers now artisan studios was originally a model dwelling which these pages intend to show more of. 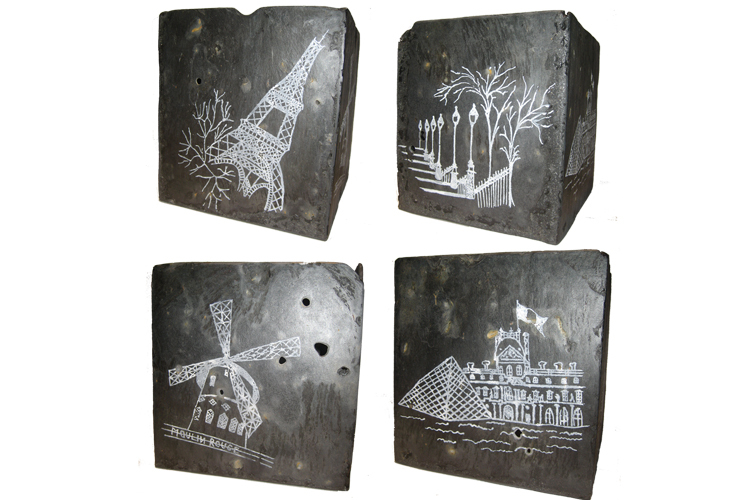 Do come and have a look but be careful if you encounter LondonKillsMe they may try to sell you a slate pot printed with Clerkenwell whether you want one or not. 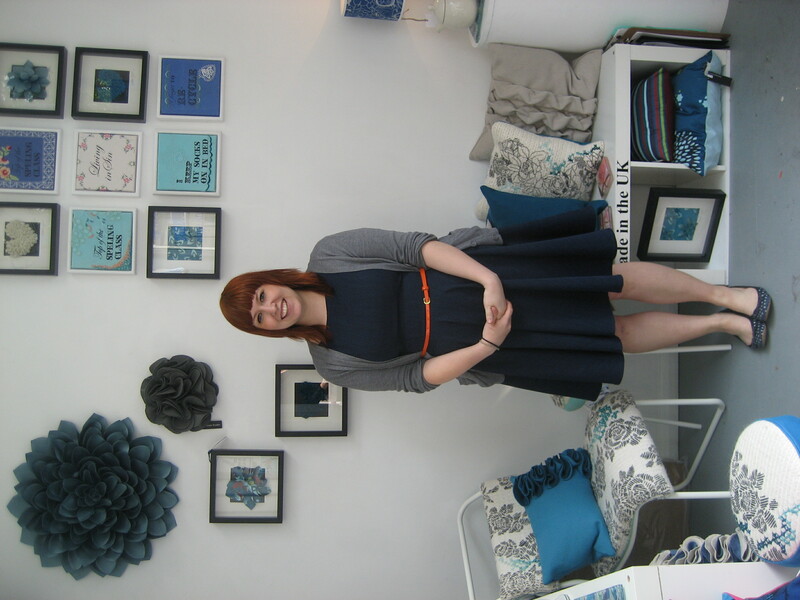 Despite sketchesbyboz’s aversion to all things Royal Wedding related which we generally go out of the way to avoid, an exception was made on Tuesday for the opening day of a unique pop-up event at Clerkenwell Green. 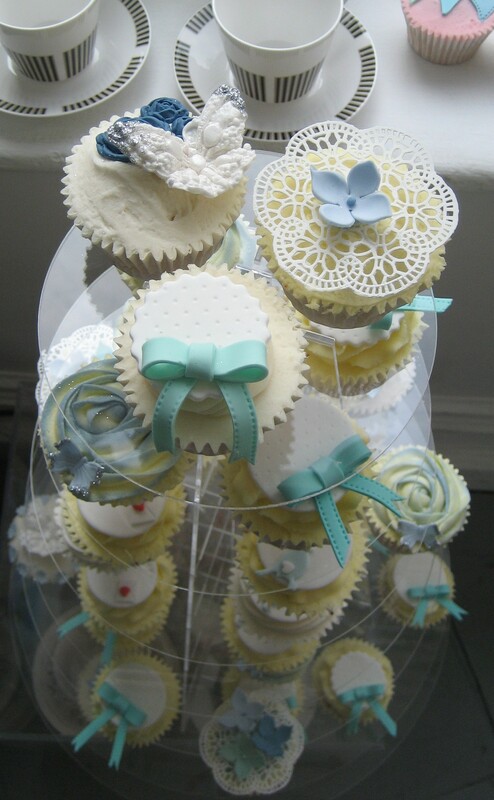 for beautiful cup cakes made in any colour you choose. 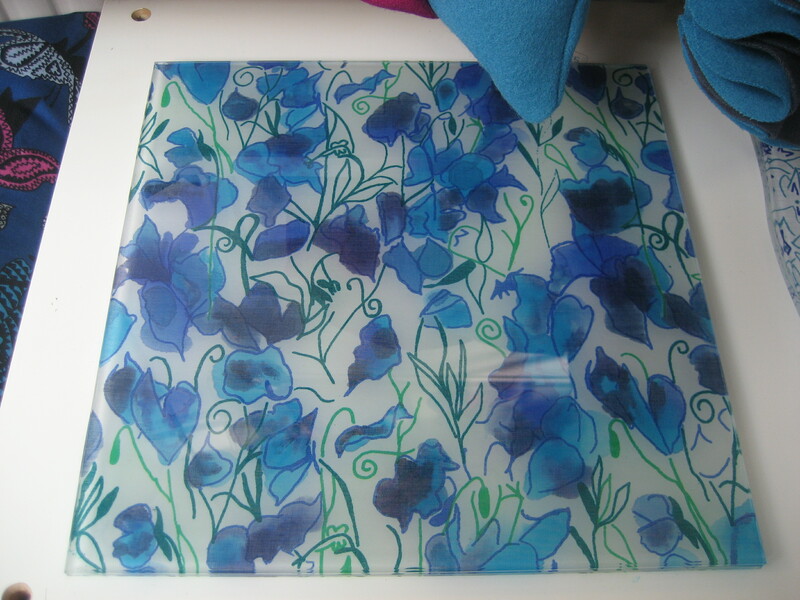 The theme of ‘Something Blue’ had been chosen as pertinent to Royal Wedding week but the unique designs on display are all elegant pieces for spring and summer. 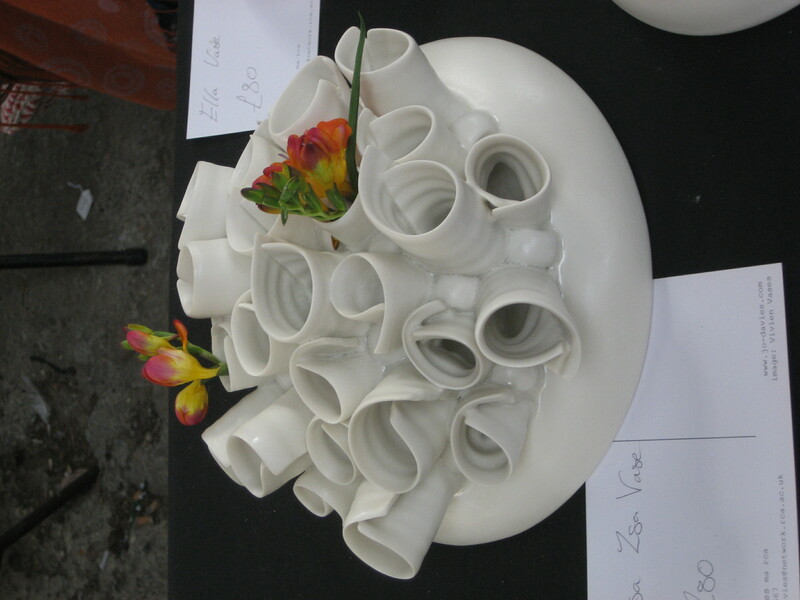 From Lorna Syson were her signature wall sculptures. 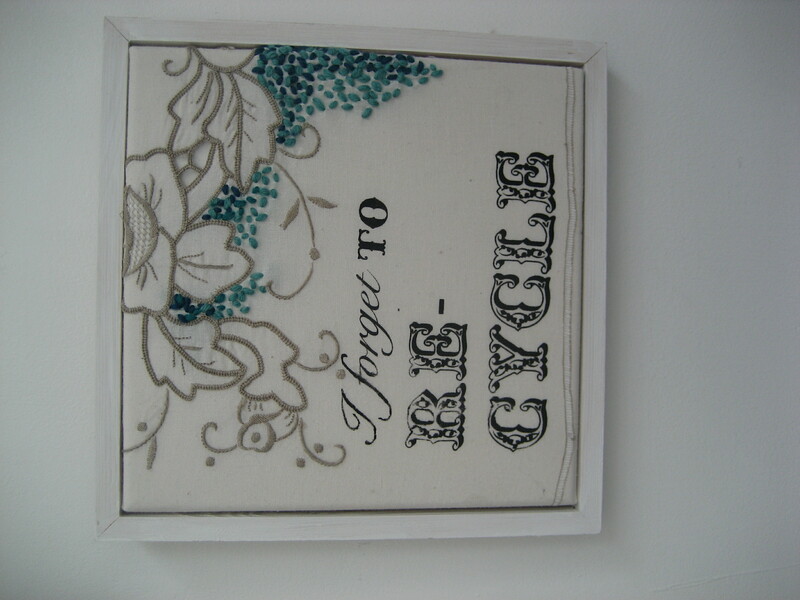 Absolutely stunning wall art made from eco friendly satin and wool. 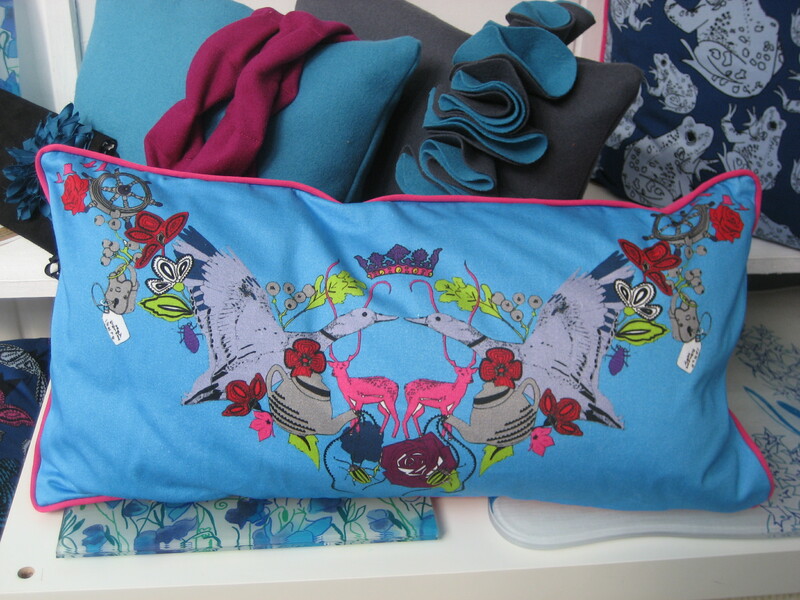 Imaginative printed textiles by Sarah-Jayne Guest collection include spectacular cushions and lampshades. 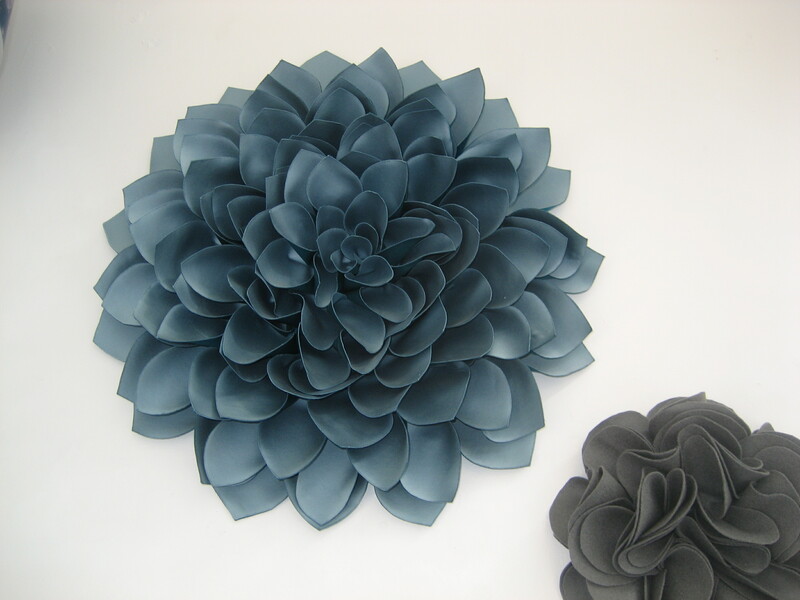 Something Blue runs until Sunday 1 May so if you are looking for something away from the television and the hype this weekend head over to Clerkenwell Green and see for yourself. Last Saturday 2 April LondonKillsMe were very pleased to be able to participate in the first day of a new fixture taking place every Saturday through to September this year. 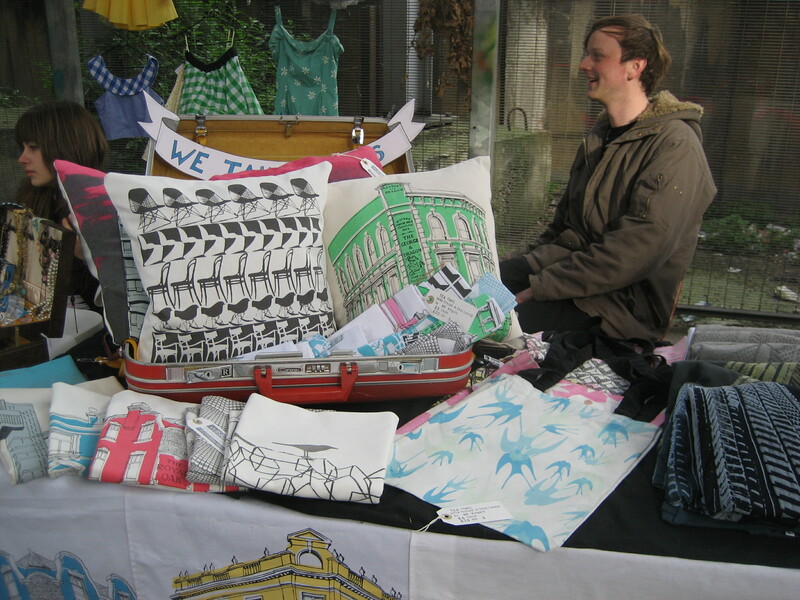 Saturday was a beautiful sunny day and the new Designer Maker market attracted a nice crowd conducive to a lovely friendly atmosphere for browsers and designers on the stalls. 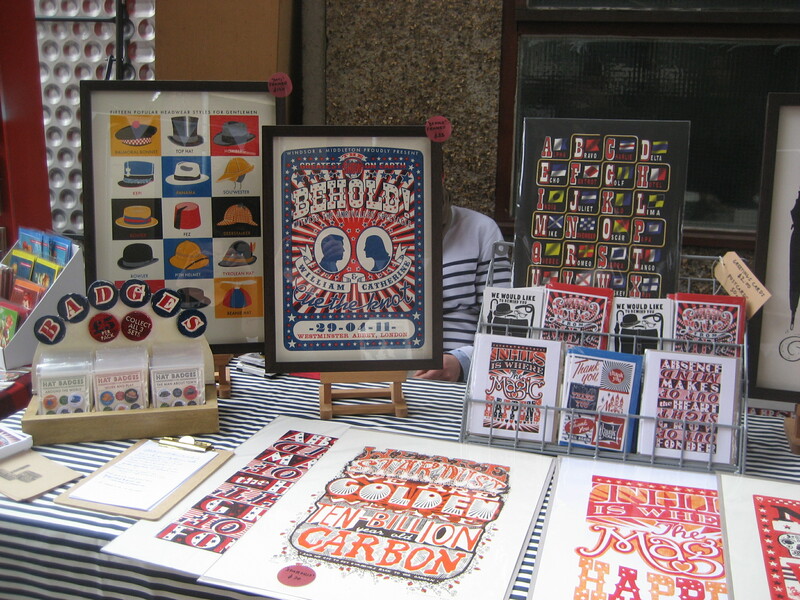 The distinctive signage was designed and printed by James Brown at www.generalpattern.net whose striking prints are available to purchase at the market. 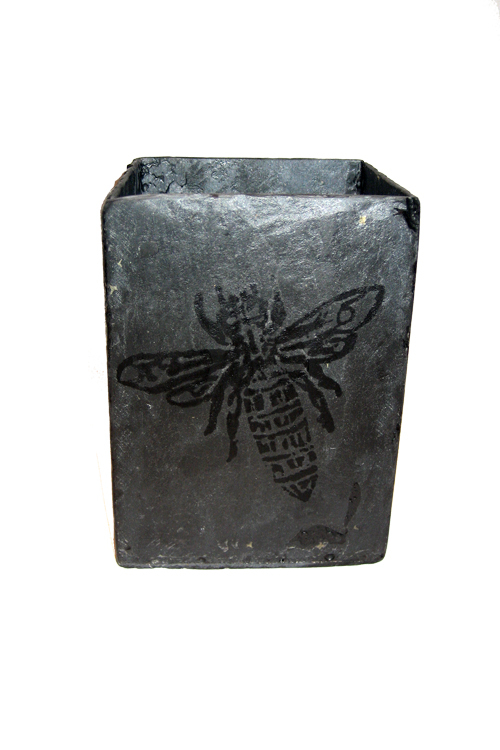 LondonKillsMe had a collection of reclaimed slate planters for Spring. 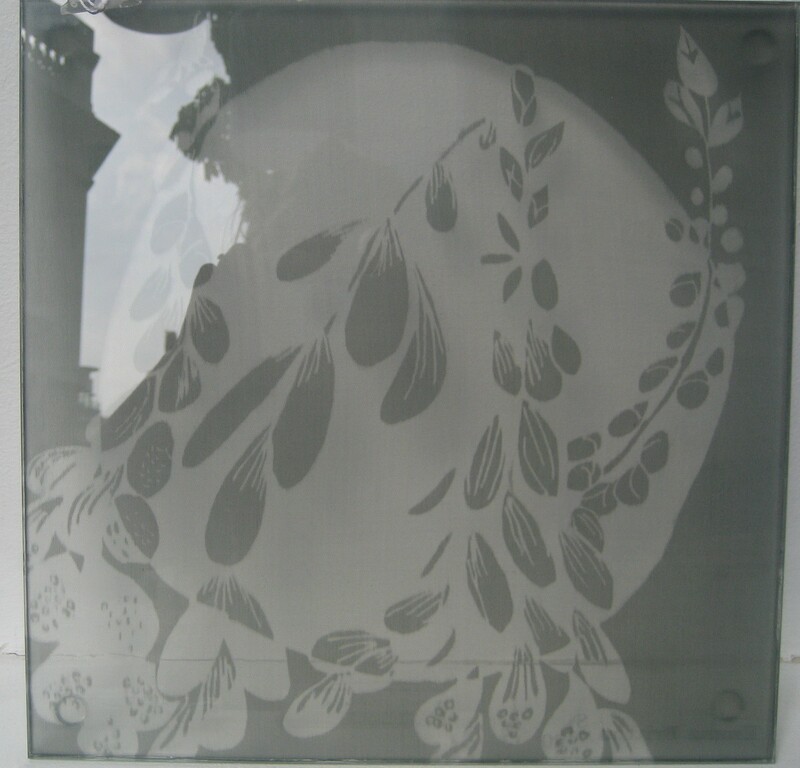 This coming Saturday we will include some new slate plant pots printed with the Truman chimney and containing a growing Hop plant. 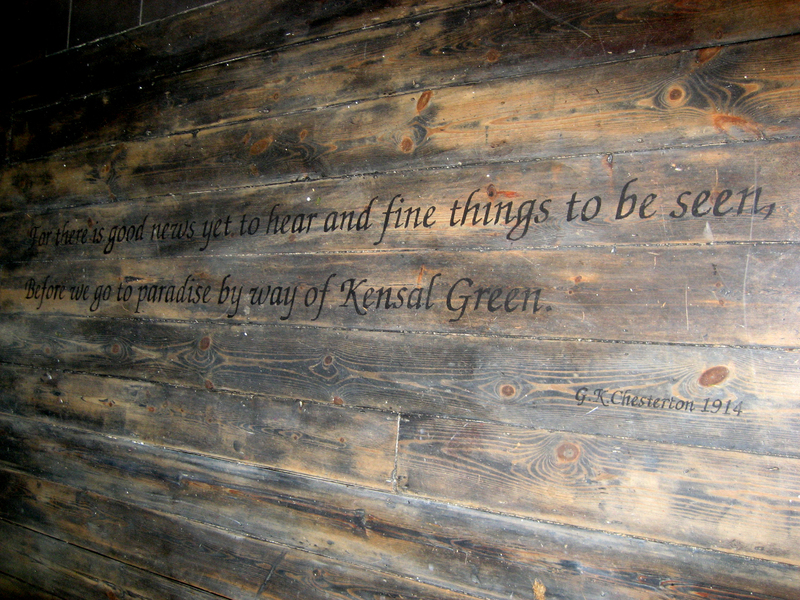 sketchesbyboz is interested to find out more about the history of the London Fields public house. All we have managed to learn so far is that it was renamed the London Fields in 1989 and was from at least 1915 the Warburton Arms briefly owned by jazz musician Art Christmas between 1952 and 1954. Apparently there has been an inn on the site occupied by the London Fields since the sixteenth century. 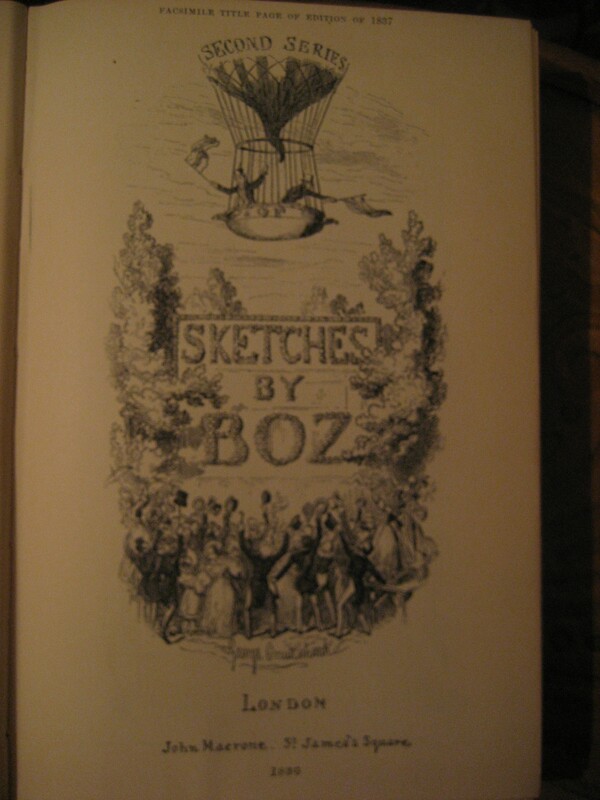 Although interestingly no such establishment is noted in the the Booth Survey notebooks, which is unusual given the investigators’ penchant for gleefully describing any den of iniquity they happened upon. So we would be very pleased to find out more so if any historians of Hackney can enlighten us we would love to hear from you. 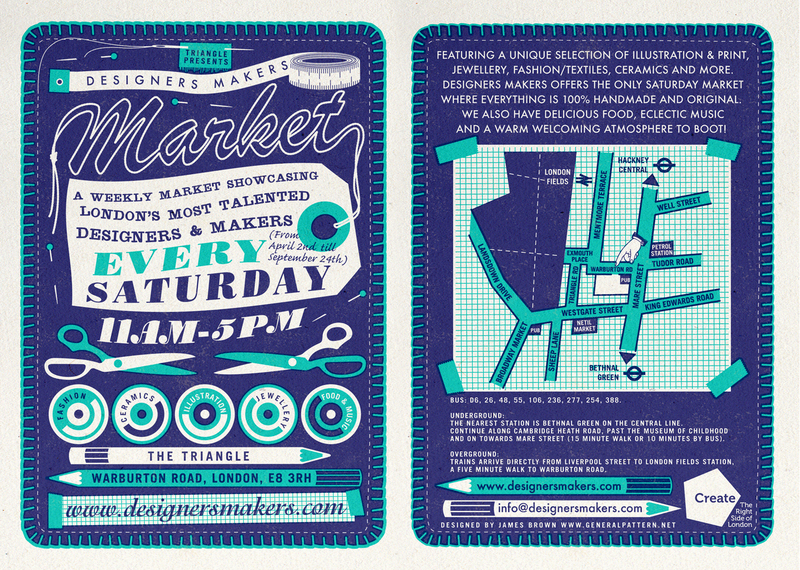 We will be returning to the Designer Maker market this coming Saturday so do consider a trip to Hackney to see for yourself how delightful it is and try out the excellent cake stall. All the details you need to get there are included in the flyer at the top of this post. This week LondonKillsMe set up a further Twitter account twitter.com/sketchesbyboz for this blog. To follow historians; writers; museums; historic societies and those informed in building restoration which may be pertinent for the building site. Much more of the building site (also known as the LondonKillsMe studio) in coming weeks and months . . . . but hopefully not years. 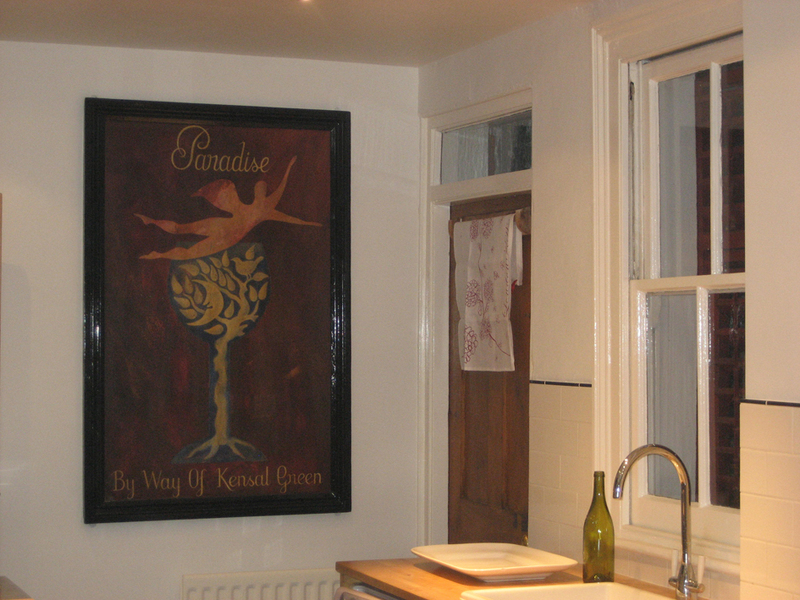 In choosing a suitable profile image for Twitter this put us in mind of another building site in Kensal Green which is now a finished project. Part of the interior design at the Kensal Green house detailed screen printed floors. The first was to the kitchen, reproducing two lines of the G K. Chesterton poem The Rolling English Road (1914). 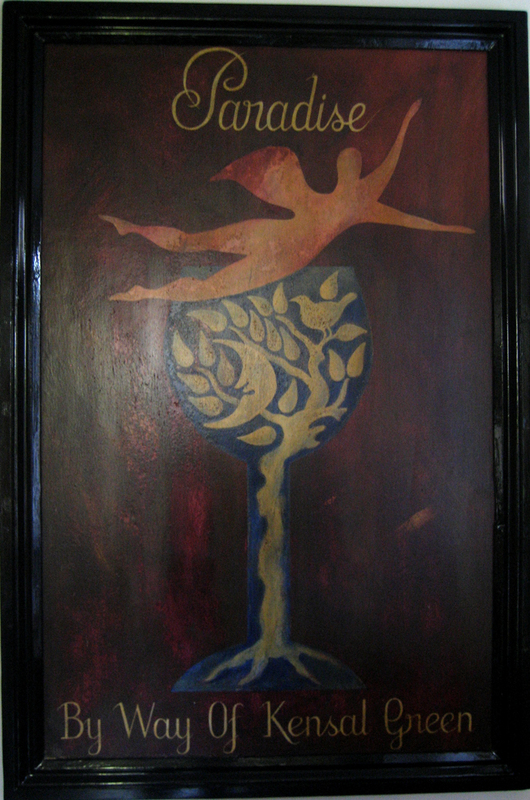 The screen for this had to be drawn by hand and an old french door served as the frame. Following this we were delighted to be given a barely salvageble pub sign but salvage it we did. Rotted at one end and encrusted in cemented footprints a good application of two pack wood filler, a little bit of artistry with acrylic and varnish and around thirty six hours restored the primitive painted sign back to life. 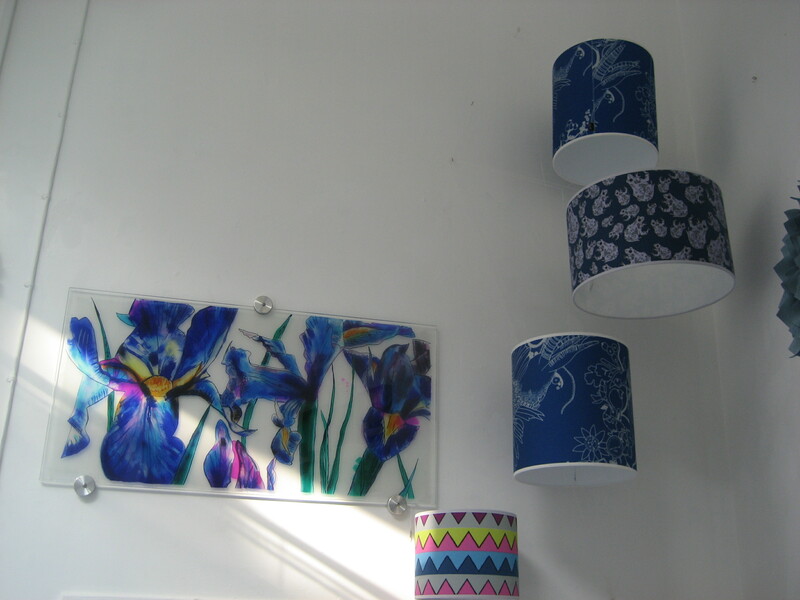 The end result completed the cemeterial theme for the kitchen of the house in Kensal Green. 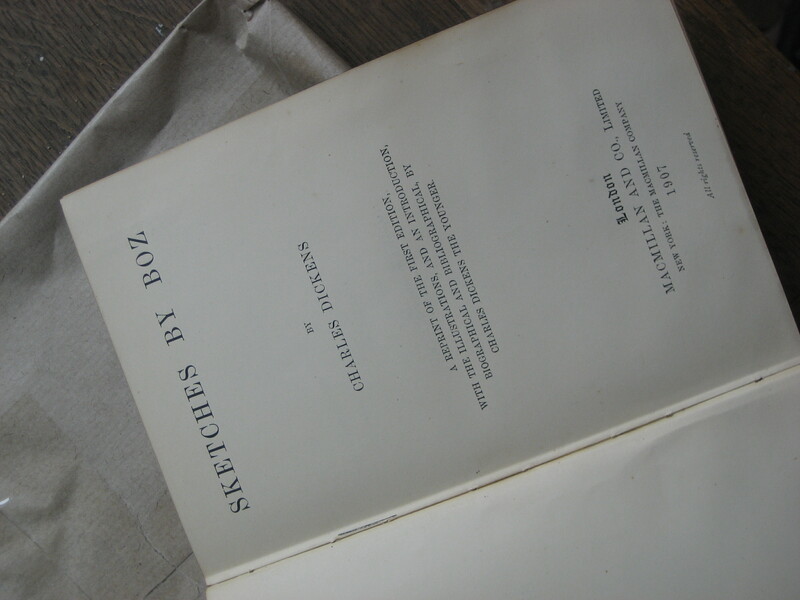 Incidentally G K Chesterton wrote Charles Dickens: A Critical Study (1906) and the entry for Charles Dickens in the 14th edition of the Encyclopedia Britannica (1929). 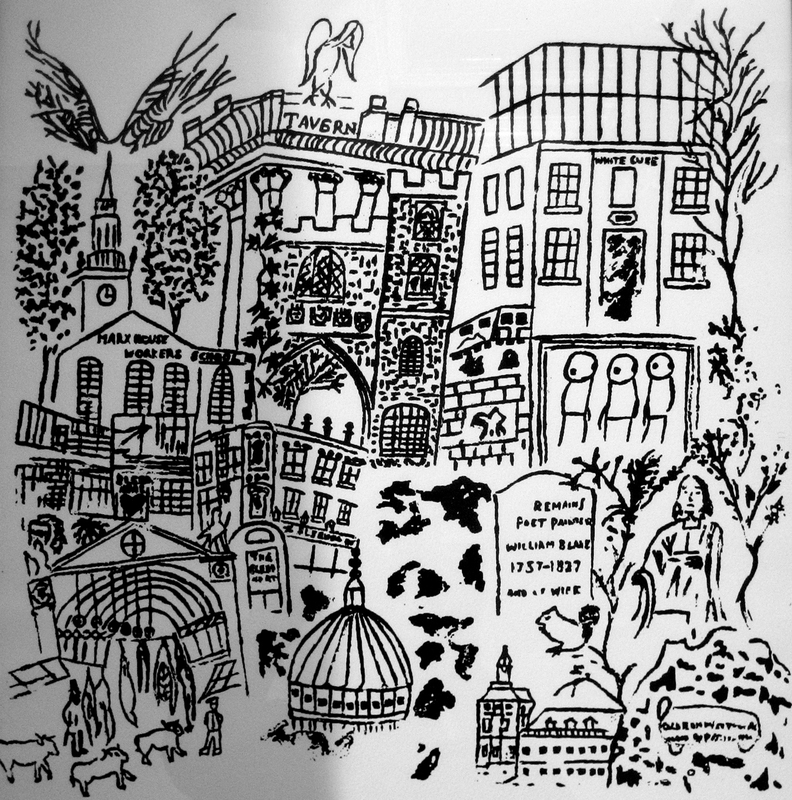 And thus it seemed fitting to use Paradise as the image for the profile of sketchesbyboz who when in that part of town continues the occasional sojourn to Kensal Green Cemetary.